MEETING Simon for the first time was one of the most sublime experiences I’ve had. With every coy head nod, casual hand wave and deep eye gaze, I felt he already knew me. Simon is a humanoid robot being developed at the Georgia Institute of Technology for the purposes of exploring intuitive ways for people and machines to live and work alongside one another. I had designed the robot’s shell — its outward appearance — so I knew exactly what to expect, but interacting with it as a programmed and somewhat sentient creature surprised me in ways I hadn’t expected. Simon understood spoken sentences and used social skills to respond appropriately. If it didn’t understand a certain request, it raised its arms in an apparent plea for forgiveness or tilted its head to express confusion. Its ears lit up when it recognized a color, and it spoke back to me when I was finished talking. 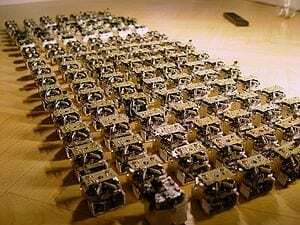 Simon, a research effort and not meant to be sold, is part of a growing collection of social robots that can essentially see, hear, feel and react through humanlike sound and movement. Our future may not match our sci-fi fantasies of androids with limbs, torsos and expressive faces meandering around our rooms to pick up clothes and mix cocktails, but robots are entering our homes in subtle ways, through countertop appliances, hand-held tools and wearable gadgets that display specialized and isolated robotic behaviors. YOUR coffee maker or camera may already have some of these elements, responding automatically to shut themselves off or follow a sequence of timed commands (wait 30 seconds, take a picture; at 6 a.m. start brewing, etc.) and the next generation of products will be only more sophisticated in this regard. Whereas designers typically use form, color and materials to make an object express some human element (a drill handle may have a pattern that looks aggressive, a toaster might have knobs and dials that seem friendly), we’re entering a time when sound, light and movement are equally important parts of the creative palette. Everyday objects whose expressive elements have long been static will now glow, sing, vibrate and change position at the drop of a hat. The behaviors of these future robotic objects may be utilitarian, like a lamp that bends to follow the items you reposition on a desk, or they may provide feedback, like a fork that vibrates when you’re eating too fast. They won’t require you to press a sequence of buttons to make things happen, but they will work alongside you in unobtrusive ways, responding to caresses, waves or verbal commands. Some might just sit back and observe you to understand what you need. A robotic cutting board might guide you while you cook and offer helpful tips when your knife skills aren’t up to par. Many products will be connected to the Internet, with access to what’s happening in the larger world. A raincoat might glow or whistle when it knows you’ll need it on your commute. Many webcams used for video conferencing already raise their heads to let you know when someone is ready on the other side of a conversation and soon during a chat they will mimic your body’s movements to help express your point to a friend across the globe. A medicine bottle might open its lid to offer you a precise dose or automatically call your pharmacist when it’s empty. Washing machines will text or call you when your laundry is done. Robotic appliances will become ever more energy-conscious — many automated thermostats already adjust themselves appropriately, combining knowledge of their users’ patterns with information about how to conserve energy.